The City of Ashland's wastewater treatment plant operates as a secondary treatment system for five months (December 1-April 30), and as a tertiary system the remaining seven months (May 1- November 30). Both processes discharge into Ashland Creek approximately 1/4 of a mile above the confluence of Bear Creek. The City of Ashland's Wastewater Treatment Plant uses a biological nutrient removal (BNR) process to treat wastewater. In a biological process, oxygen is dissolved into the wastewater to drive the treatment process. Microbial growth is initiated in the system which feeds upon the organic material in the wastewater. Nutrients, mainly organic nitrogen, are removed from the wastewater through the BNR processes of nitrification and denitrification. The Carrousel Oxidation Ditches and secondary clarifiers are the major unit processes responsible for removing the carbonaceous biochemical oxygen demand (CBOD), total suspended solids (TSS) and nutrients from the wastewater. The Carrousel Oxidation Ditches are a process invented by DHV and licensed from Eimco Process Equipment Company, now known as Baker Process. The Carrousel Oxidation Ditch process is a variation of the traditional oxidation ditch activated sludge process. The unique features of the Carrousel include basin configuration and the device used to provide aeration and mixing. The Carrousel basins are typically deeper than standard oxidation ditches and turbine aerators are used instead of brush aerators. The biological treatment operation of the oxidation ditch depends upon a population of organisms in the oxidation ditches which convert the organic material in the wastewater to new cells, and the subsequent settling and removal of the organisms in the secondary clarifiers. Each part of the process must operate well to achieve good treatment. The population of microorganisms, referred to as mixed liquor (ML), is maintained in the oxidation ditches and is responsible for the wastewater treatment and nutrient removal. These microorganisms feed on the soluble and suspended matter in the wastewater. Organic material is used to provide energy for the organisms and create new cells. Nutrients are also required for new microorganism growth. Nitrogen and phosphorus are primarily required along with other nutrients in smaller or trace quantities. Mixed liquor organisms are "aerobic" organisms, requiring the presence of oxygen for life. Oxygen is introduced in the aerobic portion of the oxidation ditch by the aerators. The aerators agitate the surface of the water, thereby entraining air into the water. Agitation also insures proper mixing while the rotation of the aerators maintains channel velocity. The aerobic basin treats the organic material in the wastewater and is also designed to provide nearly complete oxidation of the influent ammonia (nitrification). A portion (up to three times the influent flow) of the nitrified mixed liquor is returned from the aerobic basin to the anoxic basin where the microorganisms in the return activated sludge (RAS) metabolize the organic material in the incoming wastewater using the nitrate in the recycled mixed liquor as a source of oxygen. The result is denitrification and the release of nitrogen gas during agitation in the aerobic basin. The nitrified oxidation ditch flow continuously bleeds from the oxidation ditches back through a gate into the anoxic basin to maintain the process. The anoxic basin on each Carrousel Oxidation Ditch consists of a 0.35 million gallon concrete tank at the head end of each ditch. Each anoxic basin is equipped with a 15-hp submerged turbine mixer to keep the solids in suspension. Raw sewage mixed with RAS enters the anoxic basin at the southern end through the tunnels from the splitter box. In the anoxic basin, the influent is mixed with the nitrified mixed liquor suspended solids (MLSS) to provide conditions for denitrification. Bacteria in the mixed liquor feed on the carbon-rich influent, using molecular oxygen from the abundant nitrate to drive metabolic reactions. Here nitrate is reduced to nitrite. The MLSS from the anoxic basin enters the oxidation ditch through a channel at the inside wall of each basin. The MLSS flows completely around the basin before reaching the overflow structure where a portion of the flow is diverted to the secondary clarifiers. It is during this time in the oxidation ditch that the nitrogen gas is stripped and released to the atmosphere. A manually-controlled bypass gate adjacent to the overflow box controls the amount of recycle flow that is permitted back into the anoxic basin. Each oxidation ditch consists of a 1.7 million gallon racetrack-shaped concrete basin. Each of the basins is equipped with two 100-hp surface aerators. The impeller blades of the aerators throw mixed liquor above the water surface and downstream, entraining oxygen and maintaining sufficient water velocity to keep the contents of the basin mixed. The amount of oxygen transfer depends upon the relative speed and submergence of the aerator blades. The submergence of the blades is controlled by the weir gate on the overflow structure, which varies the water depth in the oxidation ditch. The deeper the submergence, or the higher the water level in the basin, the more oxygen delivered. A deeper submergence also draws more electrical power and decreases the oxygen transfer efficiency. Probes for dissolved oxygen, pH, and alkalinity display the values for each basin and transmit the values to the SCADA system for automatic control. The dissolved oxygen value is used to activate, deactivate, increase, or decrease the operation of the aerators. The pH and alkalinity values are used for process control and to determine the need for caustic addition. Mixed liquor from the oxidation ditches flows in a common 30-inch diameter pipe to the mixed liquor (ML) splitter box where it is distributed to the three secondary clarifiers. The secondary clarifiers perform several functions simultaneously: clarification; settling; thickening; and solids removal as part of the secondary treatment process. The perimeter of each clarifier is fitted with a baffle to prevent the scum from exiting the tank over the weir. The secondary effluent V-notch weirs are positioned nine inches outside the scum baffle. The secondary clarifiers provide calm conditions for settling the solids present in the mixed liquor. The mixed liquor solids settle out of the liquid stream lowering the TSS and CBOD of the secondary effluent. Sludge that accumulates on the bottom of the clarifier flows by gravity to the return activated sludge/waste activated sludge (RAS/WAS) Pump Station. The secondary treatment process requires that a certain amount of biomass be present in order for the biological activity to take place. To satisfy this, the secondary sludge consists of a colony of cells which are returned to the head of the oxidation ditch process by the RAS system. Biomass not required in the secondary system is wasted through the WAS system. This waste activated sludge is then dewatered, using centrifuges. Operators haul an average of one 12 yard dump truck load of dewatered solids a day to Dry Creek Landfill in White City. The clarified secondary effluent flows from each clarifier to the ultraviolet (UV) Influent box where the flow from the three clarifiers is combined. It is then distributed in the UV disinfection process. The function of the disinfection system is to reduce the number of disease-causing organisms such as viruses, bacteria, spores, mold, yeasts, algae and certain protozoa, in the plant effluent prior to discharging it to the receiving water body or pumping it to the membrane filter system. Disinfection is achieved with ultra-violet (UV) light. This process does not add any chemicals to the water that would require subsequent removal or produce potentially harmful by-products. Of the current methods of disinfecting water, UV disinfection can be considered the most effective, safest, sustainable, and pollution free. The water is exposed to UV light generated by using a series of medium pressure, high intensity lamps. The secondary effluent flows over the submerged surface of quartz lamp sleeves, which emit intense UV light to disinfect the microorganisms suspended in the water. The lamps contain a small amount of mercury gas and emit UV light due to a combination of gas pressure and electrical current in a wavelength of 254 nm. Radiation emitted from UV light 8 at this wavelength penetrates the cells of the organisms and causes a transformation of the genetic material of the organism, killing it or making it unable to reproduce. Once the clarified effluent has been disinfected through the UV system, it is aerated prior to being released to Ashland Creek. This completes the secondary treatment requirements for discharging to Ashland Creek. The WWTP discharges secondary effluent to Ashland Creek for five months (December 1-April 30) out of the year. During the rest of the year (May 1-November 30), the secondary effluent is pumped to a series of membrane filters for further treatment. While the secondary treatment system is a biological process (needs to be kept alive), the tertiary system is a barrier process. In other words, it provides a physical barrier that will not allow anything past it. The membrane microfiltration system is located immediately downstream of the secondary clarifier. This tertiary treatment system is designed to provide a high quality effluent for direct discharge to Ashland Creek. We operate the tertiary system seven months out of the year, from May 1st until November 30th. The Department of Environmental Quality (DEQ) has established a very strict phosphorus discharge limit of 1.6 lbs/day. The membrane filtration system has been tested and shown to successfully remove alum-coagulated CBOD, TSS, and phosphorus from the secondary effluent to below NPDES permit limits. The system has four membrane treatment trains immersed in open tanks which operate in parallel. The feed water comes directly from the secondary clarifiers, and enters the membrane tank inlet distribution channel. Aluminum Sulfate (Alum) is introduced just upstream of the secondary clarifiers to precipitate the phosphorus. The remaining water is moved through each membrane under a low differential pressure vacuum by use on a permeate pump. In order to prevent an excessive amount of particle accumulation in the membrane, a backpulse pump is periodically used to reverse the flow and dislodge these trapped particles. This reject water is pumped back through the secondary treatment process. Typically, laboratory results on the membrane system shows a non-detect for total phosphorus and e-coli (Pathogens). The CBOD and TSS results are very near 100% removal also. 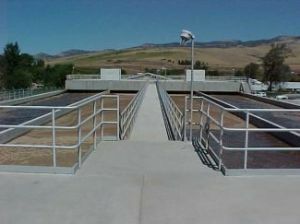 As of May 2002 when the tertiary system was completed, the Ashland Wastewater Treatment Plant was the only plant in North America using this process. Both the secondary and Tertiary systems discharge an effluent that is well under regulatory standards as established in our National Pollutant Elimination Discharge System (NPDES) permit. The quality of the effluent that comes off the Tertiary system may offer us many different opportunities in the future for water reuse.